MILAN Fashion Week rolls round again, and anticipation is mounting for the Prada show. But it’s not just about the clothes – we’re just as eager to see the sets. A long-standing collaborator with Rem Koolhaas’ design studio, AMO (it also designed Fondazione Prada in Milan), Miuccia Prada has, since 2007, been welcoming her guests with scenographic theatres of all types at Prada HQ on Via Fogazzaro, minus a couple of exceptions. Her most recent pre-fall show, for instance, was held in the warehouse that holds pending artworks for Fondazione Prada, causing fashion insiders to speculate on this season’s location. Here, we relive 11 spectacular sets that still pack a visual punch. This was the season that AMO studio collaborated with American-German company Knoll on a series of design objects for the ‘ideal home’, with an interior populated with geometric furniture, objects and manifestations of everyday life, with screens that featured interior and exterior views onto a cityscape. Conceived by AMO studio as an abstract representation of a small town, the spring menswear set was lined with murals of tropical palm trees, sunsets, helicopters and « menacing » shapes. Helicopters whirled on the soundtrack to add to the threatening mood. Artists came together to collaborate with Prada on a series of murals and illustrations that mused on themes of femininity, representation, power and multiplicity. Inspired by the politically-charged murals of Diego Rivera, muralists including Gabriel Specter and Stinkfish and illustrators Jeanne Detallante and Pierre Mornet saw their work almost enveloping the audience – and making its way onto clothes. The main surprise? Britney Spears was on the soundtrack. 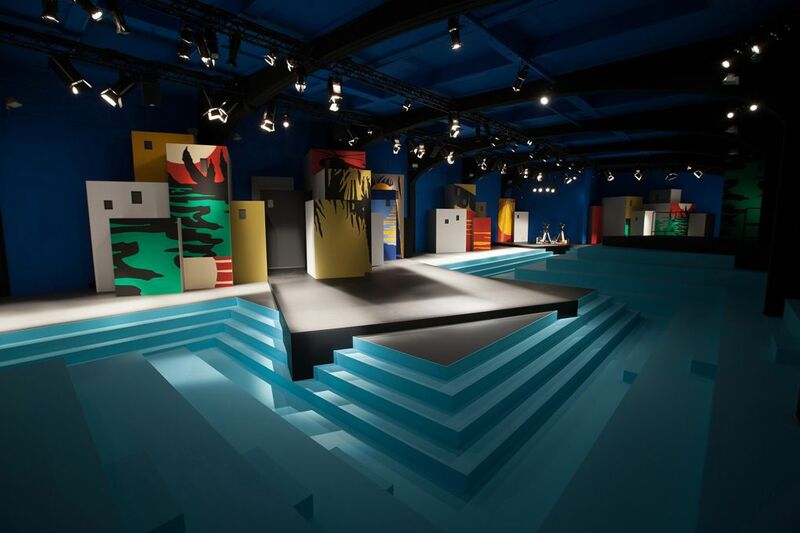 For the previous menswear show, AMO had transformed the show space into a swimming pool. They reversed the impulse for the womenswear show, erecting purple dunes which were a stunning and unexpected backdrop, with models pacing through the desert on a brown carpet that lined the edges of the set. Blue and black « fake » marble lined the walls of the men’s show, which sported metal ceilings and metal floors; Frédéric Sanchez put Front 242 on the soundtrack. Billed as an investigation of « the perception of continuous space through an invasion of the ceiling », the spring set featured fibreglass and polycarbonate « stalactites » hanging from the ceiling, illuminated by an orange glow. This was the show where AMO Studio built a mesh ramp on the remnants of the previous season’s set. Defined as « layers of different architectures », the ramp was illuminated by lights, and was conceived by American director David O. Russell as a surreal dreamscape, and featured a preview of his collaborative short film with Prada, Past Forward. For the first time, Prada showcased its resort show in its newly renovated Osservatorio, a top-floor exhibition space for contemporary photography in the Prada store in Galleria Vittorio Emanuele II in Milan. Millennial pink and mirrors combined with benches oriented towards a rooftop view of the Galleria’s dome. Inspired by the « bare simplicity of everyday life », AMO studio constructed a series of domestic set-ups lined by an extending wooden ‘boiserie’, a partition between the private, Seventies-inspired teenage bedrooms and an urban front covered in posters. Designed by AMO studio in collaboration with NYC-based design studio 2×4, the spring set featured the work of eight visionary artists – including Brigid Elva, Giuliana Maldini, Trina Robbins and Fiona Staples – whose artistic aim was to illustrate women in a « uniquely empowering way ». The graphic panels also included archival work of Tarpé Mills, creator of the first female action hero – which popped up again in the collection.